Clever use of glass ensure a light and modern contemporary barn conversion that's all yours. With spacious interiors and outdoor living space there's plenty of room for all to enjoy a special break away. Hepple Barn is absolutely made for entertaining with great open communal space, a large dining table for wonderful meals enjoyed together and a fantastic country kitchen which is at the heart of this luxurious holiday let. It has has everything you could need including a breakfast island. 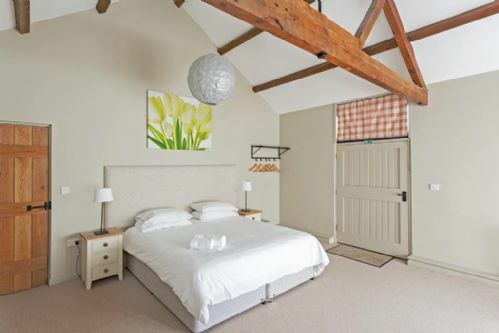 The lovely converted barn is all open plan with high beamed ceilings and the full length windows that run along the front of the property ensure warmth and light at all times. Add to that the beautiful touches throughout with traditional stable doors, lots of places to lounge together plus the 6 bedrooms where everyone can enjoy their own private space. The bedrooms are brilliantly laid out with zip and link beds so you can best organise your own rooms making Hepple Barn truly family friendly. Outside with your own private courtyard and covered BBQ area all enclosed with Cotswold stone, children can play freely whilst ensuring your own peace of mind. Just beyond these walls is the Chimney Nature Reserve with its walks and several acres of private land to create your own adventures. Wonderful memories can be made at Hepple Barn, perfect for bringing the family together to enjoy all the space this property offers and the wonderful places to explore beyond. Hepple Barn can be booked with Hoxton Barn and Hendrick Barn to sleep groups of up to 30 so these barns can be equally idea for even larger gatherings of friends and family, or for corporate bookings. Service rating : An excellent company to deal with who excelled our expectations especially when they replacd a faulty dishwasher on a Saturday, and it was service with a smile. Lovely accommodation, warm, bright and plenty of room for 10 ladies to cook, eat and laugh together. Product : Super accommodation in the middle of a nature reserve. Private, spacious and clean, perfect for 10 ladies to have a weekend of walking, talking, eating, drinking and laughing. Close to the Thames Path for fabulous walks. Such a great review! We are really glad that you ladies all enjoyed your stay at Hepple Barn and hope to see you again. Product : This was a brilliant property for our large family group to stay in. There were 13 of us including our 4 grandchildren and my 85 year old mum. The living areas were great - especially the beautiful kitchen and dining room. It was great to have so many ensuite bathrooms and everywhere was clean and fresh. The large grass area behind the barn is great for kicking a ball around. We loved walking down to Shifford Lock (about 10 mins) and each time we went a canal boat was coming through! It was fun to help the lock-keeper with the gates and watch the action! We enjoyed visiting the bird-hides, also a short walk away. Walk along the River Thames, visit the local pub under 3 miles away, or jump in the car and head into famous towns and villages within the Cotswolds. All is possible, oh and don't forget a trip Oxford! Garden area - Enclosed courtyard with BBQ area and nature reserve beyond. Open plan kitchen and dining room with a large dining table seating 13, fully fitted kitchen with cooker, electric hob, large fridge/freezer, dishwasher, microwave, wine cooler, kitchen island. 6 Private car parking spaces. This house will be decorated for the Christmas period.